I have this reoccuring nightmare where I'm stuck in an endless game of "Rock, Paper, Scissors." The end result is always paper and scissors and I keep shouting "No, no, scissors do not cut paper!" The scissors, you see, are my nice pair of fabric scissors and the thought of them cutting paper sends me into a panic. I'm not the only one though, as there have been countless stories of seamstresses flying off into a rage if some hapless person should even ponder using those scissors to cut out a coupon. Now the mystery can be solved as to why there are fabric scissors and paper scissors. Anyone who's ever experienced trying to cut fabric with dull scissors can understand how frustrating it is. Paper dulls the scissors' blades and, while you can get scissors resharpened, they stay sharper longer, if they should avoid paper altogether. 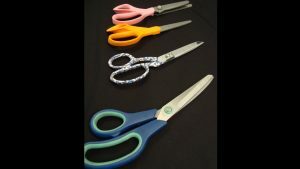 There are many different scissors found within the sewing box, as they each have their unique features. Pinking shears, for example, have zig zag shaped blades so they cut in that unique design. The function of this is because this cutting method cuts down on the amount of fraying that would normally occur to that fabric. Other kinds of scissors are rotary cutters, which come in different sizes and look very much like a pizza cutter. This is commonly used by quilters as it is best utilized in cutting straight edges. Lastly, there's thread cutters, which are smaller scissors with long skinny blades, best used for cutting loose threads and for cutting open buttonholes. 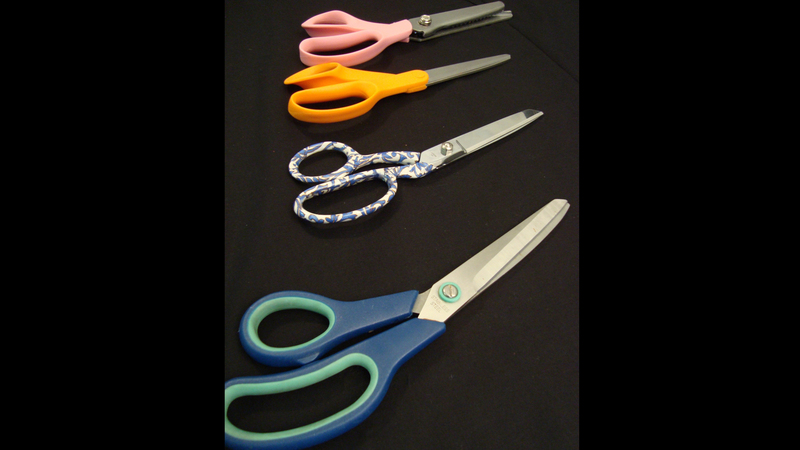 If you can only buy one pair of scissors, you can pretty much get by with a pair of regular dressmaker sheers. Just be sure to keep them sharp and they'll keep cutting for you for a long time. Congratulations, you are signed up to our newsletter. Something went wrong, please refresh this page and try again. I always wondered what the pinking shears were for and now I know! Thanks for these great instructional videos. Thank you for this video, i now know the purpose of having different scissors when you are sewing.